In this training session, you will learn to use data visualization and analytics software Tableau Public (free to use) and turn your data into interactive dashboards. You will get hands on training on how to create stories with dashboards and share these dashboards with your audience. However, the session will begin with a quick refresher of basics about design and information literacy and discussions about best practices for creating charts as well as decision making framework. Whether your goal is to explain an insight or let your audience explore data insights, Tableau's simple drag-and-drop user interface makes the task easy and enjoyable. You will learn what's new in Tableau and the session will cover the latest and most advanced features of data preparation. You will learn to create Table Calculations, Level of Detail Calculations, Animations and understanding Clustering. You will learn to integrate R and Tableau and how to use R within Tableau. You will also learn mapping, using filters / parameters and other visual functionalities. You will be able to analyze complex questions with ease and work with any kind of data to use your skills as data scientist/analyst. You will gain skills to analyze and visualize complex data sets with ease with minimum programming. In short, you will be guided using couple of data sets and will be taught to build a compelling and convincing story. You will build those stories with best visual practices. This session is for anyone who works with data with some statistics knowledge, regardless of technical or analytical backgrounds. Nirav Shah is the Founder of OnPoint Insights, a data science and software services consultancy based in Greater Boston. He has 10 years of consulting experience in data analytics, multivariate data modeling and software tools, off-line and real-time multivariate data solutions, and training customers in data analytics. He consults and teaches in applying data analytics for manufacturing, operations, process control strategies with clients to improve manufacturing process and operational efficiency. He has implemented real- time process monitoring data analytics and fault detection systems for leading bio-pharma customers and clients from other industries such as chemical, pulp and paper, food and beverages. 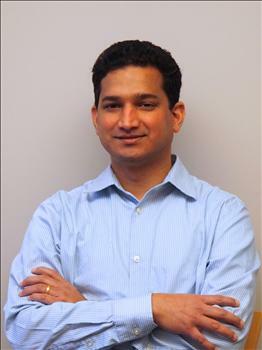 He helps customers in providing better process insights using data driven solutions. He currently teaches Business Analytics and Dashboard Visualization at a technical college and has taught courses and conducted workshops on Multivariate Data Analysis, Design of Experiments and Batch Process Analytics. He completed his dual Masters in Chemical and Computer Engineering from University of Massachusetts, Lowell and an MBA from Babson College.